Socrates Sculpture Park is pleased to announce the 2005 edition of Float, a biennial series taking place in the Park on Saturdays and Sundays in August. 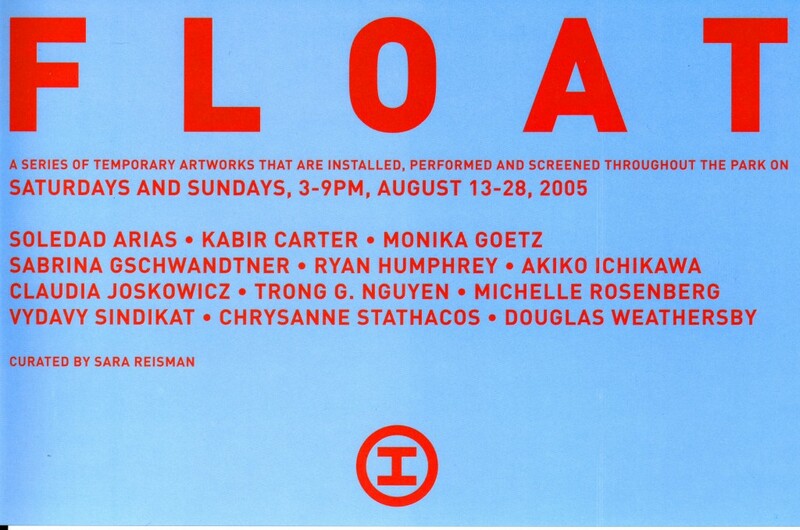 Launched in 2003, the series was first organized in response to Socrates Sculpture Park’s location on the East River waterfront. This year, Float continues to address the environment of the Park, enabling participating artists to test the limits of performative and site-specific practice through a variety of media and formats. Float presents a new selection of temporary artworks that will be installed, performed, activated, and screened throughout the Park on weekends from August 13 through August 28. Float includes artworks by Soledad Arias, Kabir Carter, Monika Goetz, Sabrina Gschwandtner, Ryan Humphrey, Akiko Ichikawa, Claudia Joskowicz, Trong G. Nguyen, Michelle Rosenberg, Chrysanne Stathacos, vydavy sindikat, and Douglas Weathersby. Projects by Soledad Arias, Claudia Joskowicz, and vydavy sindikat use collective narratives as their subject matter. On August 13th and 14th, vydavy sindikat (a Brooklyn-based group experiment) will hold participatory public gatherings in the Park, examining how notions of public and community are spontaneously formed. Claudia Joskowicz continues her ongoing Two-Second Love Stories, creating and distributing fotonovela t-shirts based on imagery and dialogue found within and around the Park. Soledad Arias’ who what where is a text-based installation that poetically questions social and political agency. Akiko Ichikawa and Chrysanne Stathacos present performative works that underscore the complexity of cultural translation. Stathacos will install a photographic piece entitled On Nature depicting global actions on nature, which invites visitors to contribute materials in gestures of wishing. Ichikawa will be producing customized t-shirts that translate cliche American t-shirt texts like “Life’s not a garden so stop being a hoe” into the recently trendy kanji and katakana characters. Monika Goetz, Ryan Humphrey, and Trong G. Nguyen respond to the physical and architectural landscape of site, through installation, performance, and intervention. Goetz deals with the waterfront’s changeability by proposing a series of glaciers that refuse to melt. Humphrey approaches the surface of the Park as the launch for a series of BMX bike performances. Nguyen inserts a temporary architectural floor plan that will disappear over the course of the series, momentarily overlaying an alternate use in the Park’s footprint. This program is supported, in part, by public funds from the City of New York Department of Cultural Affairs.